Some 650,000 people have voted on Facebook’s proposed changes to its privacy policies, with 88 percent against the changes and just 12 percent in favor. So, naturally, Facebook will go forward with them. That’s right: It really doesn’t matter to Facebook at all that nearly nine in 10 people who voted on the changes opposed them. What matters is that a far greater proportion of the site’s users didn’t vote at all—a declaration of apathy and/or confusion that Facebook will interpret as a license to proceed with whatever changes it sees fit from now on. It also doesn’t matter that the voting actually doesn’t end until 3 p.m. eastern time today. Thanks to our Nate Silver-esque prediction models, we’ve known the outcome all along. (Sorry, Karl Rove, Cuyahoga County isn’t going to swing this one at the last minute either.) You see, the vote was set up from the start so that it would only count if 30 percent of all active Facebook users participated. That’s 300 million people—almost three times the number that voted in the 2012 U.S. presidential election. The only chance of that happening would have been if Facebook had explained the vote clearly and promoted it tirelessly on its site, and even then the chances would have been slim to none. In the event, it did neither, and turnout is on pace to be less than one million. That is, less than one-tenth of one percent. To be precise, some 650,000 people had voted as of 10 a.m. Monday, with over 570,000 against the changes and fewer than 80,000 in favor. (You can cast your own vote and see the results here.) All of those numbers are dwarfed by the roughly 999 million who did not vote at all. So Facebook’s three-year experiment in offering users a vote on changes to its privacy policies will come to an end today with something less than a whimper, which is probably about how Facebook wanted it to end. In the future, whenever there’s a backlash to such changes, Facebook will be able to point to the silent super-majority who couldn’t be bothered to take five minutes to preserve their privilege to weigh in on how their own data is used. How many of these people would have taken that step if Facebook had made the process more clear, we’ll never know, but even that number is probably nowhere near 300 million. Everyone by now is so accustomed to websites’ privacy policies being incomprehensible that we’ve long since given up the idea that we can understand what happens to our personal data online, let alone control it. That said, it’s worth pointing out that a staggering number of Facebook users fell for a hoax that claimed they could prevent the site from using their information if they posted some legalistic mumbo jumbo on their own wall as a status update. 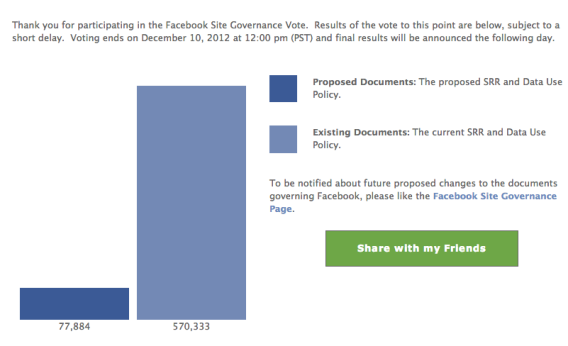 Check out the comments on Facebook’s site governance page and you’ll see they’re still falling for it in droves. Ironically, as nonsensical as it is, that fake status update went viral because it was less confusing than Facebook’s actual site governance process. The graphic below shows the number of people who voted in favor of the changes (left) and against the changes (right). Pretty lopsided, right? But consider this: If there were a bar for all the Facebook users who did not cast a vote, its height would be roughly that of a 30-story building. If there were a bar for the number of Facebook users who did not vote, it would shoot clear through your ceiling and tower over your neighborhood.